Not to be confused with Greater Blue Mountains Area, Blue Mountains National Park, City of Blue Mountains, or Electoral district of Blue Mountains. The Blue Mountains is a mountainous region and a mountain range located in New South Wales, Australia. The region borders on Sydney's metropolitan area, its foothills starting about 50 kilometres (31 mi) west of the state capital. The public's understanding of the extent of the Blue Mountains is varied, as it forms only part of an extensive mountainous area associated with the Great Dividing Range. Officially the Blue Mountains region is bounded by the Nepean and Hawkesbury rivers in the east, the Coxs River and Lake Burragorang to the west and south, and the Wolgan and Colo rivers to the north. Geologically, it is situated in the central parts of the Sydney Basin. 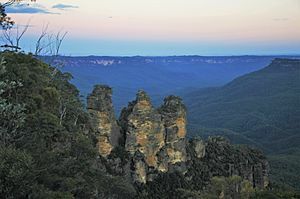 The Blue Mountains Range comprises a range of mountains, plateaux and escarpments extending off the Great Dividing Range about 4.8 kilometres (3.0 mi) northwest of Wolgan Gap in a generally southeasternly direction for about 96 kilometres (60 mi), terminating at Template:NSWcity/core. For about two thirds of its length it is traversed by the Great Western Highway and the Main Western railway line. Several established towns are situated on its heights, including Katoomba, Blackheath, Template:NSWcity/core, and Template:NSWcity/core. The range forms the watershed between Coxs River to the south and the Grose and Wolgan rivers to the north. The range contains the Explorer Range and the Bell Range. The Blue Mountains area includes the local government areas of the City of Blue Mountains, the City of Hawkesbury, the City of Lithgow and Oberon Shire. 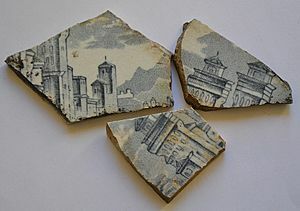 Following European settlement of the Sydney area, the area was named the Carmarthen and Lansdowne Hills by Arthur Phillip in 1788. The Carmarthen Hills were in the north of the region and the Lansdowne Hills were in the south. The name Blue Mountains, however, was preferred and is derived from the blue tinge the range takes on when viewed from a distance. The tinge is believed to be caused by Mie scattering which occurs when incoming light with shorter wavelengths is preferentially scattered by particles within the atmosphere creating a blue-greyish colour to any distant objects, including mountains and clouds. Volatile terpenoids emitted in large quantities by the abundant eucalyptus trees in the Blue Mountains may cause Mie scattering and thus the blue haze for which the mountains were named. 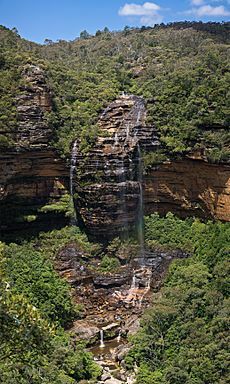 When Europeans arrived in Australia, the Blue Mountains had already been inhabited for several millennia by the Gundungurra people, now represented by the Gundungurra Tribal Council Aboriginal Corporation based in Katoomba, and, in the lower Blue Mountains, by the Darug people, now represented by the Darug Tribal Aboriginal Corporation. The Gundungurra Tribal Council is a nonprofit organisation representing the Gundungurra traditional owners, promoting heritage and culture and providing a support for Gundungurra people connecting back to Country. Gundungurra Tribal Council Aboriginal Corporation has a registered Native Title Claim since 1995 over their traditional lands, which include the Blue Mountains and surrounding areas. 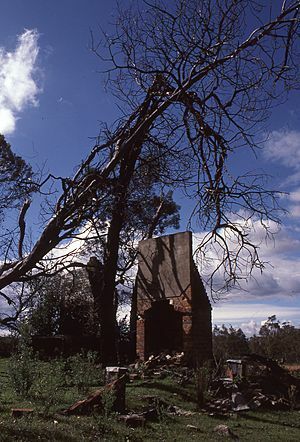 Examples of Aboriginal habitation can be found in many places. 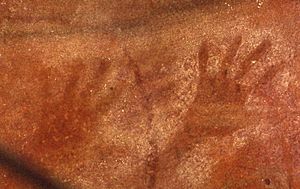 In the Red Hands Cave, a rock shelter near Glenbrook, the walls contain hand stencils from adults and children. On the southern side of Queen Elizabeth Drive, at Wentworth Falls, a rocky knoll has a large number of grinding grooves created by rubbing stone implements on the rock to shape and sharpen them. There are also carved images of animal tracks and an occupation cave. The site is known as Kings Tableland Aboriginal Site and dates back 22,000 years. Arthur Phillip, the first governor of New South Wales, first glimpsed the extent of the Blue Mountains from a ridge at the site of today's Oakhill College, Castle Hill. He named them the Carmarthen Hills, 'some forty to sixty miles distant..." and he reckoned that the ground was "most suitable for government stock". This is the location where Gidley King in 1799 established a prison town for political prisoners from Ireland and Scotland. The first documented use of the name Blue Mountains appears in Captain John Hunter’s account of Phillip’s 1789 expedition up the Hawkesbury River. Describing the events of about 5 July, Hunter wrote: "We frequently, in some of the reaches which we passed through this day, saw very near us the hills, which we suppose as seen from Port Jackson, and called by the governor the Blue Mountains." During the nineteenth century the name was commonly applied to the portion of the Great Dividing Range from about Goulburn in the south to the Hunter Valley in the north, but in time it came to be associated with a more limited area. It is possible that the accomplishments of this expedition were suppressed by Hunter, who may not have wanted convicts to know that there was a relatively easy way out of Sydney. Wilson was killed by Aborigines after abducting one of their women for his personal use, but he had accomplished much as an explorer. He was never recognised as the first person to cross the mountains, possibly because his Coxs River journey could not be verified, while his route west of Mittagong may have been the "long way around" for a colony that had its eyes fixed on the sandstone fortress west of the Nepean. Between 1798 and 1813, many people explored various parts of the mountains, from the Bilpin Ridge to the southern regions, today the site of the Kanangra-Boyd National Park. Still, they did not find a definite route across the mountains. The 1813 crossing of the Blue Mountains by Gregory Blaxland, William Lawson and William Charles Wentworth is officially credited as the first successful European crossing. Blaxland set out with Lawson and Wentworth on 11 May 1813 and succeeded in crossing the mountains by 31 May. They ventured as far as to what is now Mount Blaxland, just west of Coxs River. Evans and his party reached the Fish and Macquarie rivers, and the site of Bathurst. On 7 July 1814, construction of a road across the mountains was begun by William Cox. The work was at the behest of Governor Macquarie. 30 convict labourers and 8 guards completed the road on 14 January 1815 after 27 weeks of hard work. Since the Blue Mountains are rich in coal and shale, mining for these resources began in Hartley Vale in 1865. J.B. North ran a shale mine in the Jamison Valley in the 19th century, and other operations were set up in several places. Locations for mining activities included the Jamison Valley, the upper Grose Valley, Newnes, Glen Davis and the Asgard Swamp area outside Mount Victoria. Shale mining failed in the long run because it was not financially viable. The climate varies with elevation. At Katoomba, (1,010 m or 3,314 ft) the summer average maximum temperature is around 22 °C with a few days extending into the 30s (80s–90s °F) although it is quite common to see maximum temperatures stay in the teens when east coast troughs persist. Night-time temperatures are usually in the teens but can drop to single figures at times. During winter, the temperature is typically around 10 to 11 °C in the daytime with −1 °C or so on clear nights and 3 to 4 °C on cloudy nights. Very occasionally it will get down to −3 °C or slightly lower but usually the coldest air drains into the valleys during calm, clear nights. The Blue Mountains is not known for particularly cold mornings compared to other areas on the Central Tablelands, such as Oberon, Bathurst and Orange. There are two to three snowfalls per year, although settled snow has become less common in recent decades. In the lower mountains, however, the climate is significantly warmer. Annual rainfall is about 1,050 millimetres (41 in) in the Upper Blue Mountains with many misty days. The Greater Blue Mountains Area is sometimes considered to be part of Greater Western Sydney region. The predominant natural vegetation of the higher ridges is eucalyptus forest. Heath-like vegetation is present on plateau edges above cliffs. The sheltered gorges often contain temperate rainforests. There are also many hanging swamps with button grass reeds and thick, deep black soil. Wollemia nobilis, the "Wollemi pine", a relict of earlier vegetation of Gondwana, is found in remote and isolated valleys of the Wollemi National Park. The main natural disasters to afflict the area are bush fires and severe storms. In recent years the lower mountains have been subjected to a series of bush fires which have caused great loss of property but relatively little loss of life. The upper mountains had not had a major fire for some decades until December 2002 (the Blackheath Glen Fire) and November 2006 when an extensive blaze in the Grose Valley threatened several communities including Bell and Blackheath (the Lawsons Long Alley Fire). This latest fire burned for almost a month but was extinguished, mainly due to a change in the weather, without loss of human life or property. A program of winter burning seems to have been successful in reducing fires in the upper mountains. 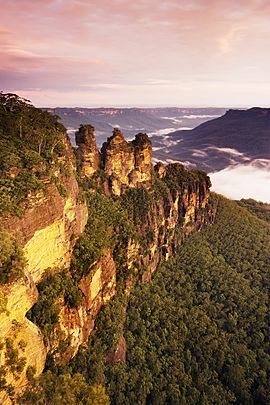 The Blue Mountains are a dissected plateau carved in sandstone bedrock. They are now a series of ridge lines separated by gorges up to 760 metres (2,490 ft) deep. The highest point in the Blue Mountains, as it is now defined, is an unnamed point with an elevation of 1,189 m (3,901 ft) AHD , located 7 kilometres (4.3 mi) north-east of Template:NSWcity/core. However, the highest point in the broader region that was once considered to be the Blue Mountains is Mount Bindo, with an elevation 1,362 m (4,469 ft) AHD . 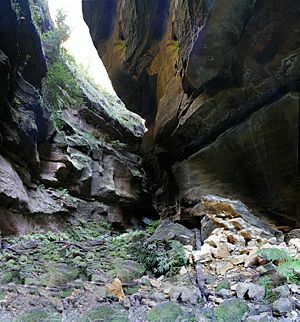 A large part of the Blue Mountains is incorporated into the Greater Blue Mountains Area World Heritage Site, consisting of seven national park areas and a conservation reserve. The Blue Mountains area is a distinct physiographic section of the larger Hunter-Hawkesbury Sunkland province. This is in turn a part of the larger East Australian Cordillera physiographic division. 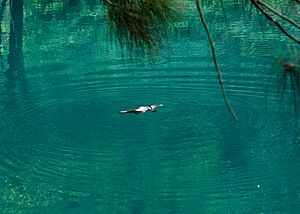 The Greater Blue Mountains Area is inhabited by over 400 different forms of animals. Among them are rare mammal species like spotted-tailed quoll, the koala, the yellow-bellied glider, and long-nosed potoroo. There are also some rare reptiles, like the Blue Mountain water skink. There are also some dingos in the area, which form the top predators and hunt for grey kangaroos. The Edge Cinema offers visitors a panoramic view of the Blue Mountains. The Giant Stairway walking track runs down a cliff into the Jamison Valley, near the Three Sisters, providing access to nature walks through the valley. Jenolan Caves, a series of limestone caves south west of Katoomba. The Katoomba Scenic Railway is the steepest funicular railway in the world according to the Guinness World Records, and originally part of the Katoomba mining tramways constructed between 1878 and 1900. The cable railway line descends 415 metres through sandstone cliffs, via a rock tunnel with a maximum gradient of 52 degrees. Also, at this location is the Scenic Skyway, a glass-bottom aerial cable car that traverses an arm of the Jamison Valley, and the Scenic Cableway, the steepest aerial cable car in Australia. The Norman Lindsay Gallery and Museum at Faulconbridge, operated by The National Trust of Australia and is located inside the former Norman Lindsay homestead, Springwood. The Toy and Railway Museum at Leura. Knapsack Viaduct, also a location where the bell miner bird can often be heard. Lennox Bridge, Glenbrook, on Mitchell's Pass which may be hiked (downhill) from Blaxland to Emu Plains (8 km). Valley Heights Locomotive Depot Heritage Museum. The Zig Zag Railway: A steam-powered railway near Lithgow. A popular way to visit the Blue Mountains is by coach. The last remaining apple orchard on the Shipley Plateau. The Explorers tree, next to the Great Western Highway, west of Katoomba. The Blue Mountains are a popular destination for rock climbers, mountain bikers and hikers as well as canyoning and other adventure sports. These sports are well catered for by guiding companies and equipment stores located mainly in Katoomba. Popular climbing destinations include the Centennial Glen cliffs near Blackheath, Mount Victoria, Mount Piddington and Mount Boyce. Climbing is currently banned on The Three Sisters. Mountain biking takes place mainly on the many fire trails that branch away from the main spine of the Great Western Highway, such as Narrow Neck, Anderson's Fire Trail and others. Likewise many of the fire trails are popular with day hikers, though many dedicated walking trails exist away from the fire roads. Canyoning in the Blue Mountains is a popular sport and caters for various skill levels. It carries inherent dangers, yet for those with the appropriate skills or those looking to take a guided trip there are many great opportunities to experience a different view of the Blue Mountains. There are numerous abseiling options available in the Blue Mountains including single and multipitch routes. There are some restrictions though with certain areas being closed for abseiling. Cricket is a popular sport in the Blue Mountains, with the Blue Mountains Cattle Dogs representing the district in the Western Zone Premier League, Country Plate and Presidents Cup competitions. Blue Mountains (New South Wales) Facts for Kids. Kiddle Encyclopedia.